I've never done anything violent to anybody. Just the minimum that was necessary. No fear, no pain. They just go to sleep. But after it's done there's no going back, no second chance. If I made a mistake, I'll pay for it. You don't always choose what you do; sometimes what you do chooses you. What is it that motivates a serial killer? What's it like inside his mind? 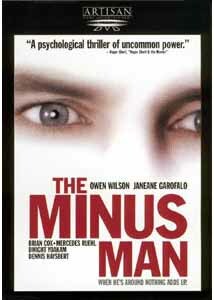 The film The Minus Man makes some speculations about this, and how, and to what extent he is different from, and more frighteningly, how much he is the same as, the rest of us. The film cheats a little by giving us a likeable, charming, softspoken serial killer, Vann Siegert (Owen Wilson), who uses poison in a flask of Amaretto to eliminate his victims. As the extras remind us, most serial killers tend to be quite violent; such a peaceful elimination of victims is quite the exception to the rule. We first meet Vann as he drives across the country, and helps out a strung-out junkie, Casper (Sheryl Crow in a fine performance). Just as it seems as if he can be trusted, the poisoned Amaretto comes out and Casper is soon a corpse left behind on a toilet in a rest stop. Vann makes his way to a small town where he takes a room with what seems to be a nice couple, Doug and Jean Derwin (Brian Cox and Mercedes Ruehl). At first Vann thinks that everything will now be fine, even saying to himself, "I feel normal now." But Vann seems to be a man with a mission that he doesn't comprehend, but just obeys. Speaking of his victims, Vann says, "They came to me like moths in the dark, because I shine." He is confronted repeatedly by an imaginary pair of detectives (Dwight Yoakam and Dennis Haysbert) who question Vann's motives and actions, but they are left with the same unclear conclusions that Vann has reached about himself. Vann knows he's doing wrong, but at the same time believes that if he weren't meant to be committing these crimes, he would have been caught by now. The town itself seems to be in complicity, with the ironic banner for the football team proclaiming "Kill 'em, Badgers! ", as well as the violence of the football game itself, and the television nature programs featuring toads devouring everything that comes in their way. The film takes the interesting step of making much of the film from the perspective of the killer. This is emphasized by the interesting lighting effects, the mesmerizing and unidentifiable sounds from the surrounds, and the increasingly distorted version of the Notre Dame Fight Song that runs through Vann's head as he tries to cope, conceal his murders, and not get caught. The usually annoying Janeane Garofalo actually turns in a fine performance as Vann's unsuspecting girlfriend, Ferrin. By the end, rather against my will, I found her completely appealing. The soundtrack is used to good effect to heighten the sense of unease that permeates the film. Between the distorted music and the bouncy good old boy tunes on the soundtrack, we get a quick look into the kaleidoscope that is the fragmented psyche of Vann Siegert. The technique of the film is deeply rooted in traditional cinema. For example, Fancher takes a page from Hitchcock by drawing the camera to the deadly flask, while an unrelated conversation goes on in the background. The camera fixedly remains there, telling us that the character is doomed, and sure enough, he picks up the flask. The title comes from the fact that once Vann settles down somewhere, people begin to disappear. The film gives us a serious look at his motives and character that really raises more questions than it answers, like all good films do. One can hardly dispute Vann's concluding thoughts: I'm not surprised this country has so much violence; I am surprised it has so little. Image Transfer Review: The image is first rate. No damage is visible. While there is not a great range of color, where there is color it is quite natural and clear, without smearing. There is a fair amount of dark shadow in the picture, but the detail is consistently clear. The ghostly dissolves that symbolize both the passage of time and the fragmented perceptions of Vann are highly effective and come across well. Audio Transfer Review: Like the video, the audio is not flashy or noisy. There is good ambient sound, such as highway noise at the rest stop, or patron sounds in the local tavern. There are not many opportunities for directionality, but when appropriate it is present and neither excessive nor minimal. Dialogue is clear and natural-sounding throughout. I noticed no subwoofer activity anywhere during the film; the surrounds are highly active through much of it, especially when Vann is alone with his thoughts. The effect is chilling. Extras Review: One of The Minus Man's claims to fame is the unusual theatrical trailer, which shows absolutely nothing of the movie, but merely follows a couple as they leave the theater and talk about the film for hours, leading to a striking conclusion, warning us that we may end up discussing the film longer than we really ought to. This original trailer is presented here, as is the trailer for home video which is much more like a traditional trailer, showing scenes of the film. The bios of serial killers are brief, but interesting. The bios of the cast and crew and the filmographies appear to be quite thorough. On both of these, the menu design is first-rate; one can run through the entire list with your thumb on the ENTER button and just merrily navigate along using that one key. No fumbling for buttons on this one. I've criticized Artisan elsewhere for its unfriendly menus, and it seemed appropriate to commend them for getting it quite right here. This film is a highly unsettling look at the mind of a nonviolent serial killer. The first person perspective may be too disturbing for some, but the exploration of his daily life is involving and fascinating. The Minus Man is a very intriguing psychological drama that cuts close to the bone in its analysis of our world and the off-kilter creatures that populate it. Recommended for those looking for serious drama, but it's not a light entertainment.